One hears quite frequently media comments about the disastrous situation with Russian demographics. 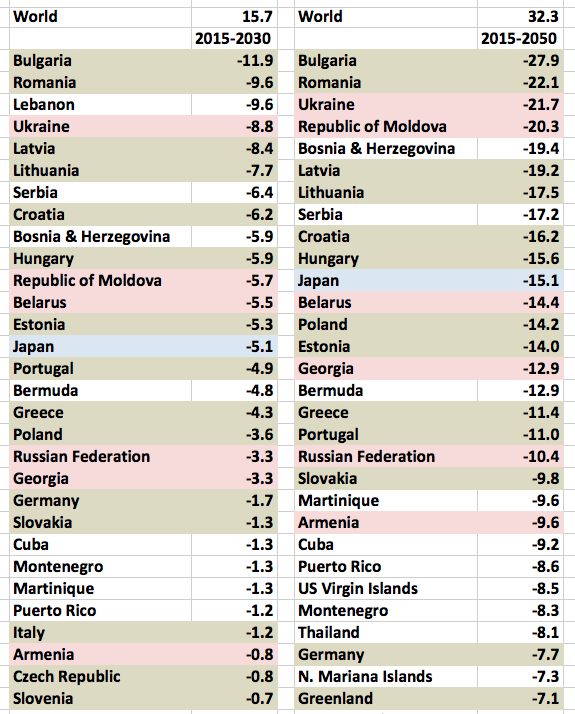 Except: Russian Federation is not in 30 countries with worst population growth performance over 1950-2015 period, while its counterparts in the USSR - Ukraine, Georgia and Belarus are. Russia will be ranked 19th worst performing (demographically) country in 2015-2030 and 2015-2050 period. 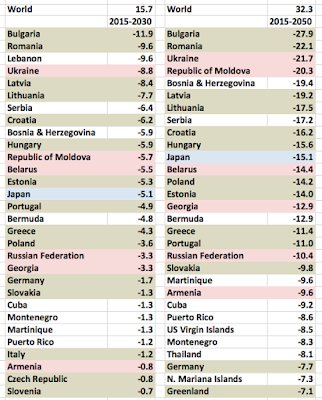 But compare this to Ukraine (to be ranked 4th in 2015-2030 period and 3rd in 2015-2050 period); Republic of Moldova (expected to rank 11th in 2015-2030 period and 4th in 2015-2050 period); Belarus (forecast to rank 12th in both periods); Georgia (ranked 20th in 2015-2030 period forecasts - better than Russia, but 15th in 2015-2050 forecast - worse than Russia). 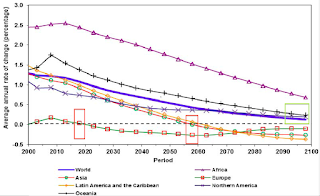 I have not heard much of 'disastrous policies' assessments in the media concerning their demographic collapse predictions. 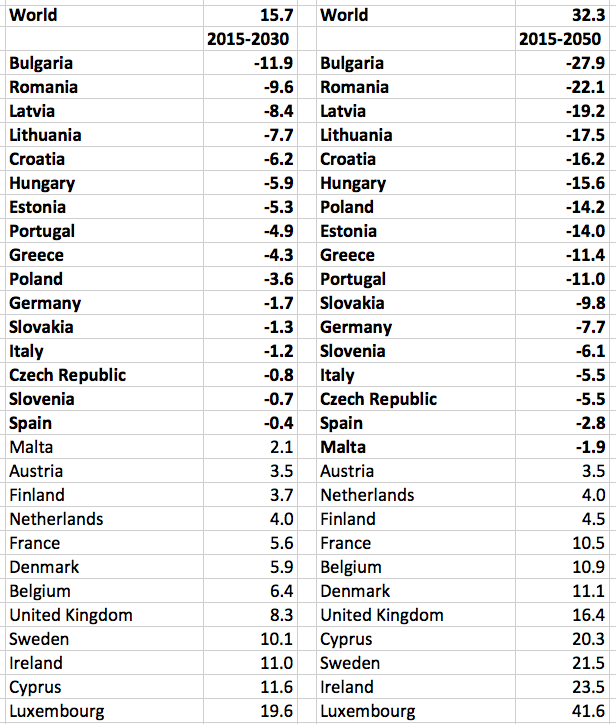 Another interesting aspect of the table is the exceptionally poor forecasted performance in demographics for the Eastern European states members of the EU. 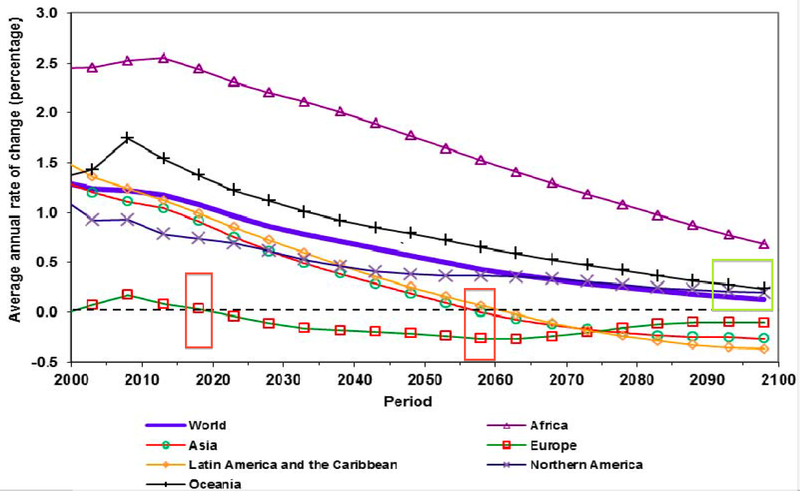 Just for comparative reminder: Russian population (the benchmark case for media-covered demographic disaster) is forecast to shrink by 10.4% between 2015 and 2050. 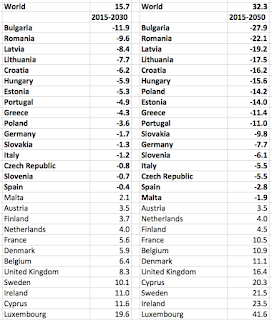 Which is bad, but better than 10 out of 29 EU member states (not benchmarks, according to the media, of a demographic disaster).